With all my culling I discovered that I was a paper hoarder. Why was I keeping 8 year old bills, receipts, junk mail, oh my !!?? When I realized that all this paper was not useful and I sure did not love it, I needed to do something with it. I started to burn it in the fire it, but that was not a good idea as the neighbors calmly told me that the ashes were drifting onto their property.We all have to be polite to our neighbors, so I stopped when I realized I was becoming a nuisance. I than started to research have someone shred the papers up for me. The local office supply chain charges an arm and a leg to do it per pound. I had a lot of papers, lot of weight. I didn’t want to just throw it all in the garbage recycle bin for security reasons. So what did I do… “Google it”. 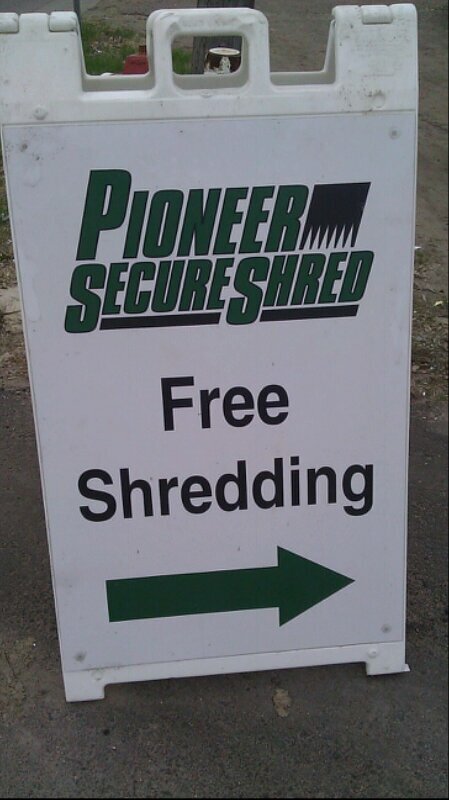 “Free paper shredding” I found a local company that does paper shredding monthly, and for free! Yahhh!! This is a great resource that solved my problem. 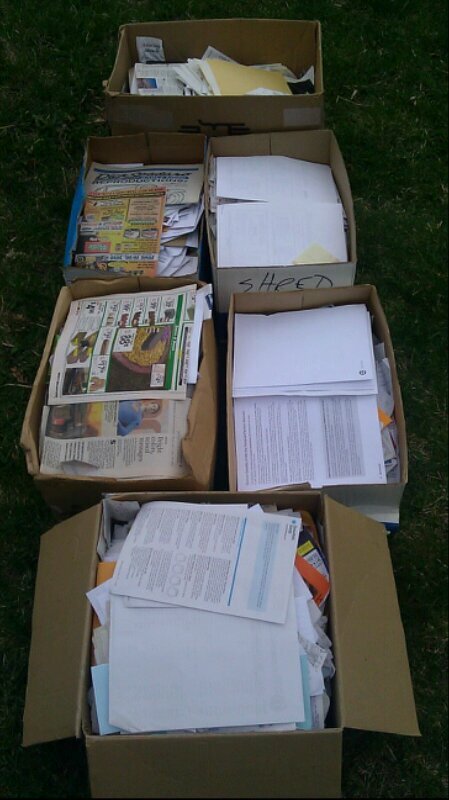 Being caught up now, I collect all papers in one container bin to do the monthly trip. #1. burn papers and bug the neighbors! #2. shred the papers by hand, which would take forever. #3. risk my data security throwing into regular recycle pickup. I encourage you to checkout what resources are available in your area. If you are in the Minneapolis – Saint Paul, Minnesota area check out http://www.pioneersecureshred.com/services. I have done two trips there, and each time shredded 6-8 boxes of paper. They shred in the parking lot, on site, and it is very efficient system. Highly recommended! This has helped me not to be a paper hoarder. The photo below is what I brought on my latest trip. This entry was posted in Uncategorized on June 3, 2015 by troykoubsky. tournage on A culling I go !